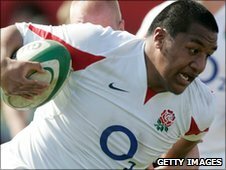 Bristol prop Mako Vunipola says there is no talk of a Grand Slam in the England Under-20 side despite winning all three Six Nations games so far. The 20-year-old has been a starter in the victories over Wales, Italy and France but says the team are grounded. "No one is talking about a Grand Slam and to do so would be disrespectful to Scotland and Ireland," said Vunipola. "The target is to win every game we play and we're en route for that at the moment, but there's a long way to go." England's Under-20 side beat Wales in their opening fixture in Llanelli 26-20. They followed that up with a 74-3 thrashing of Italy at Bath's Recreation Ground before defeating France last weekend 19-8 at Worcester. "It was a good old fashioned Test match against the French, the forwards had a big battle up front and the backs had some joy out wide," said Vunipola. "France came to us having won their first two games so we knew it would be tough and they didn't disappoint." The New Zealand-born prop is in his final year for the Under-20s and has been in impressive form picking up man-of-the match awards along the way. "We're a team and anything an individual does, good or bad, they are still part of a team," Vunipola added. "The majority of us are only together for one season so it's important to enjoy the time we spend with each other, as well as the rugby." England's match with Scotland takes place on Friday, 11 March at Newbury.